Threading Chelsea: Threading Is The Hair Removal For You! T hreading is another form of hair removal that people are still not used to seeing all the time. It is comparable to plucking, where you are pulling each hair individually, but threading is a quicker, and less painful process. If Unique Threading Salon is known for anything, it’s threading. We have perfected the hair removal technique and make it as enjoyable as possible and give you the best-shaped eyebrows in the city. Most people don’t know much about threading, and how it works. Threading is said to have originated in Central Asia or India. It is a very old practice that has been around for hundreds of years. Threading was usually done for women or were getting married, or celebrating a very special occasion. In other parts of the world, threading was seen to make a young girl as a woman. Now that it’s been brought to our side of the country, it has become a much more popular method of hair removal. Threading has a unique process that many people prefer over plucking or waxing. Threading takes a piece of string, that is usually a cotton-like material, and twists it into a double strand. The strands that were created and then used to precisely remove each hair by the root, which will cause long lasting results. 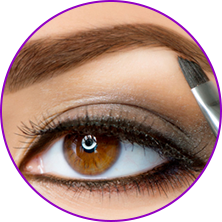 Threading can be used to create a shape in the eyebrows, remove unibrows, and raise the arch of the eyebrow. Threading can also be used in other parts of the face such as lips, sideburns, and chin. Threading is a great way to remove unwanted hair on many parts of the face. We are the experts and we know this hair removal technique is safe, effective, and long lasting. Learn more in our next blog when we discuss more in-depth benefits of threading and why you should book your appointment today!